Hola a todos y bienvenidos a Mastication Monologues! If you couldn’t tell, the flavor of today’s post is Spanish, and what a wonderful flavor that is. Spain is known for many things: sun, bullfights, and flamenco to name a few, but few may truly appreciate what a giant Spain is in the culinary world. 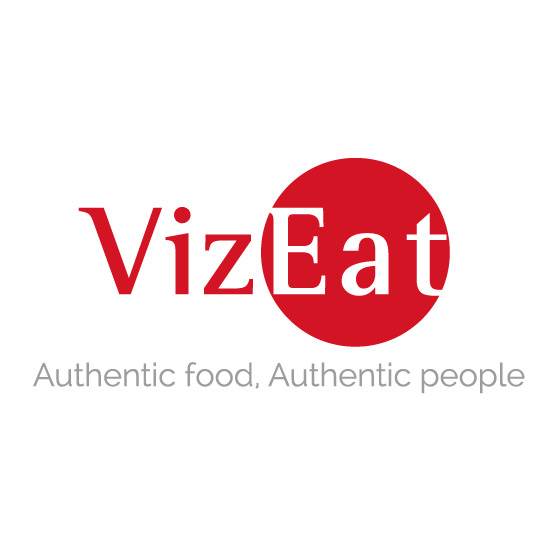 It seems like only recently that tapas have become truly popular in the United States, and we are feeling the full force of molecular gastronomy, a technique of manipulating the molecular composition of food and drink in order to render them in a different form, that was pioneered in Europe, first in France and then in Spain. 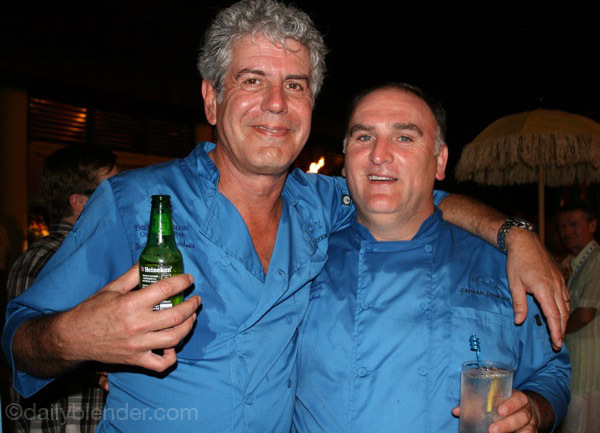 Two names of chefs/magicians that immediately spring to mind in regard to this food movement are Ferran Adrià, head of the famous but now defunct El Bulli, and José Andrés, restauranteur and one of Anthony Bourdain’s besties. However, these giants of the food world would contend that what they do isn’t molecular gastronomy. Tomato/tomahto. 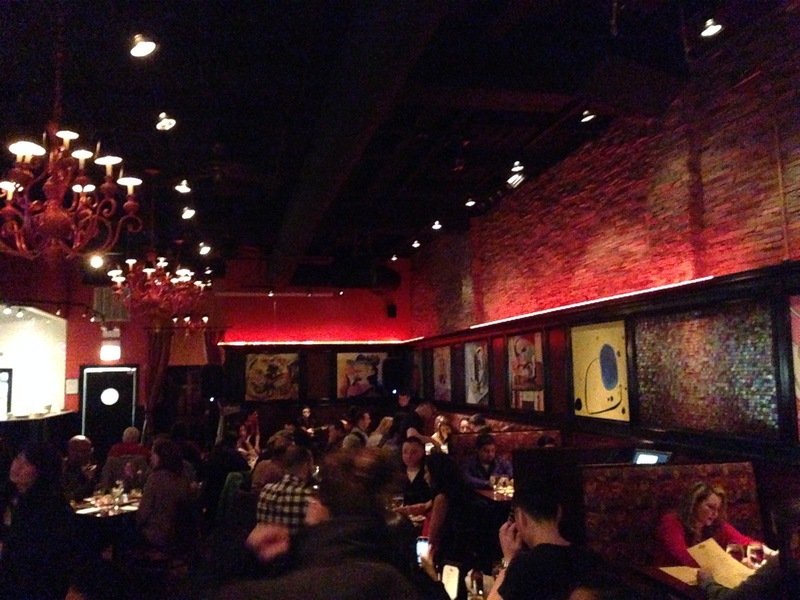 These advanced ideas have made their way even to Chicago as found at Grant Achatz’s Alinea, widely considered the best restaurant in the world, or at the wildly innovative Moto which was owned by the late kitchen mad scientist, Homaro Cantu. However, I’m not here to talk about molecular gastronomy but rather tapas. I’ve had my fair share of tapas after living in Spain, and this has served as the measuring stick for all other taperías outside of the peninsula. 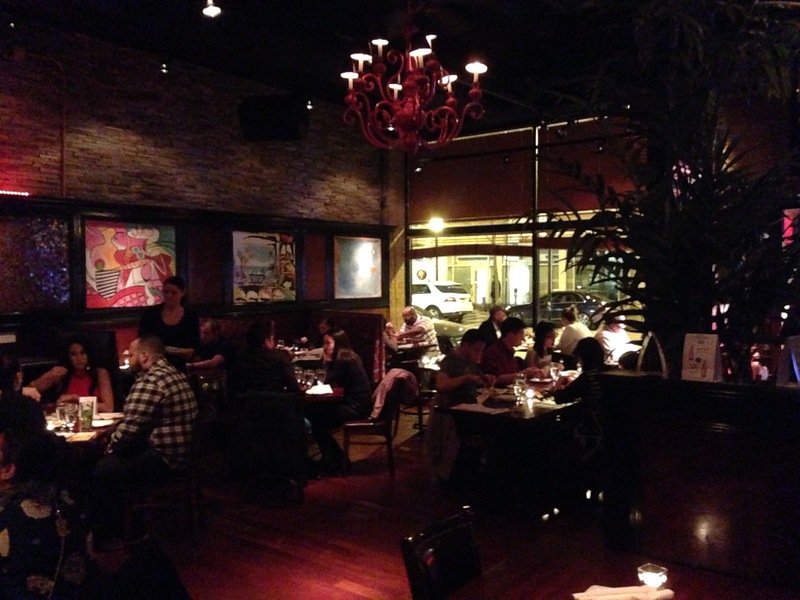 I’ve had some charming tapateos and others not so much, but I found La Taberna Tapas to be a perfect place to get some delicious finger food in the Chi. Janice and I went here back in the winter wonderland half of this year to meet two of her friends from out of town, and it was a the perfect venue to do so. The parking on the street is plentiful even though you have to pay for it. 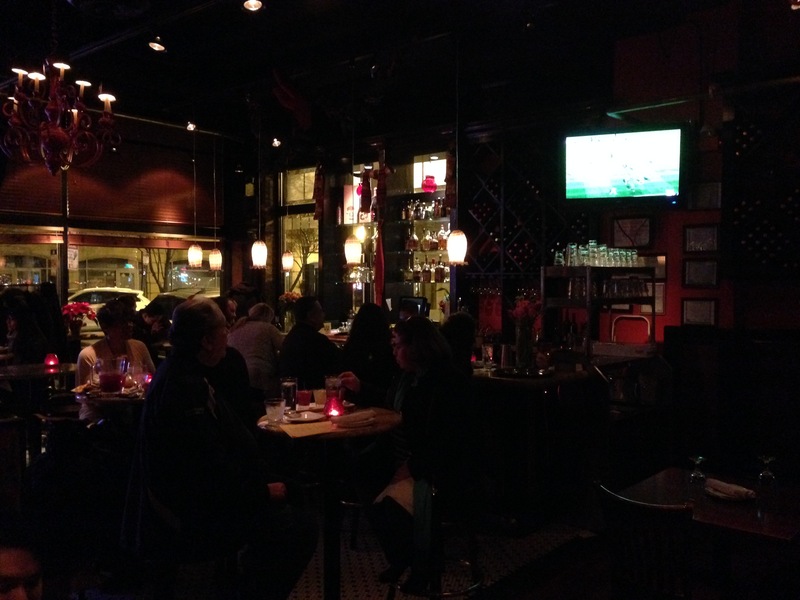 The interior was dark but welcoming, and the live music started soon after we sat down. 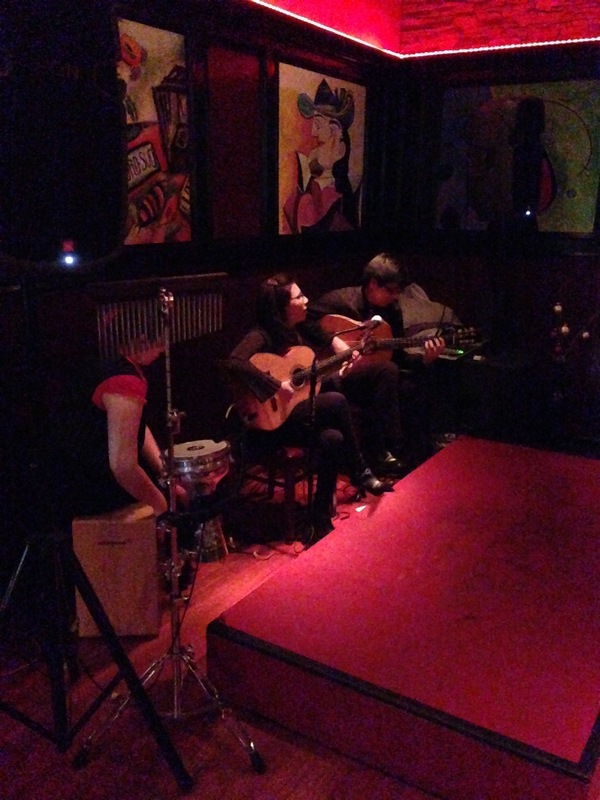 Thankfully even though it was flamenco dancing and guitar, it wasn’t overwhelming like other restaurants that I’ve been to with live music acts. I get that you’re enthusiastic about your craft, but there’s a fine line between passion and being obnoxious. Tread lightly when I’m eating, brah. Before I get to the foodstuffs, let me have a moment for the beers I tried. Both of them came from the super verdant and Celtic influenced northwestern corner of Spain known as Galicia, and the Hijos de Rivera brewery that has been making these beers will be celebrating its 110 year anniversary. Perhaps their longevity could be down to them keeping the operations 100 percent Spanish and keeping it in the family. Who knows? 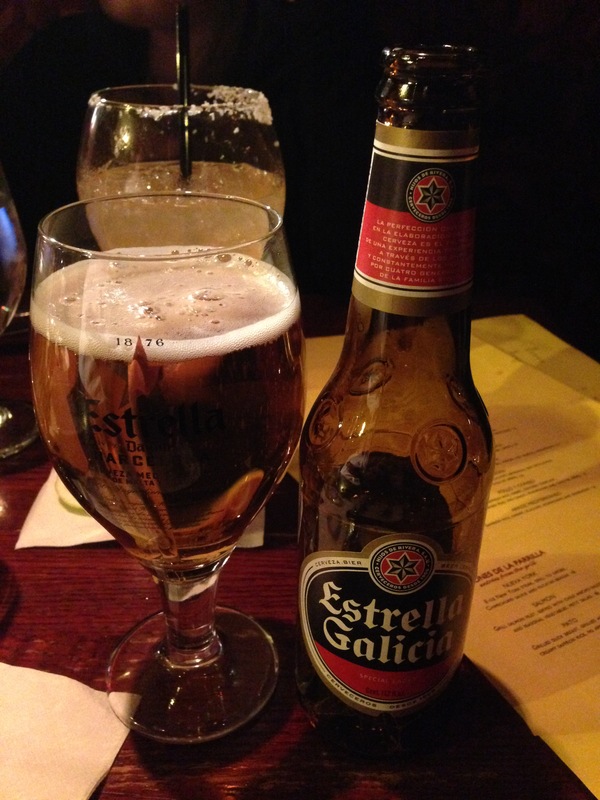 I have to say though that when living in Spain, I wasn’t too impressed overall with Spanish beers, but the Estrella Galicia ($5) had a lot more taste than the more grating on the palate Estrella Damm from Cataluña. This brew from Hijos de Rivera was a slightly bitter lager that went down smooth and heightened the bold flavors of the tapas that were to make their appearance soon. 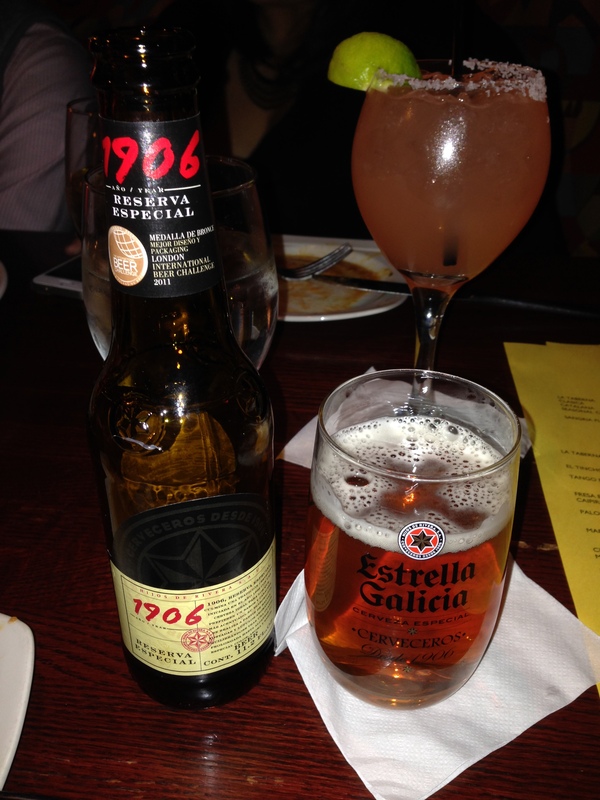 The Estrella Galicia wasn’t an upper echelon type of libation, but it’s just something refreshing to sip on. The 1906 Reserva Especial ($5) from the gallego brewery was better since it poured with a good amount of head and had more notes of caramel and grass throughout each sip. It was another solid, if not spectacular, Galician beer. Anyway, now onto the good stuff: the tapas! First, we had the pinacho de pollo that consisted of grilled chicken breast, sauteed bell peppers and onions, and garnished with a basil aioli and pistashio pesto. I would recommend this segundo plato since it is a bit more filling than the dainty plates that we followed this one up with. Not only is it satisfying, but the ingredients are superb. The succulent, pure white chicken was further amped up by the basil aioli and pesto. These elements combined with the veggies made for a complete dish that also was quite easy on the eyes. 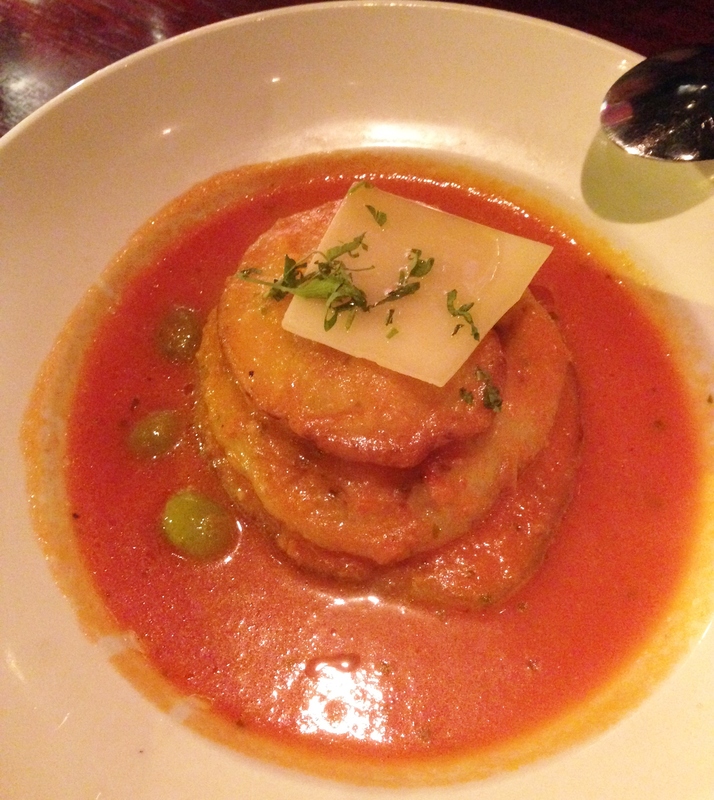 The torre de berenjena y tomate ($7) or tower of eggplant and tomato kind of fell flat in my mind and mouth. It didn’t seem that spectacular with some mushy slices of eggplant in a pool of bland tomato sauce. I’d skip this tapa unless you’re vegetarian. 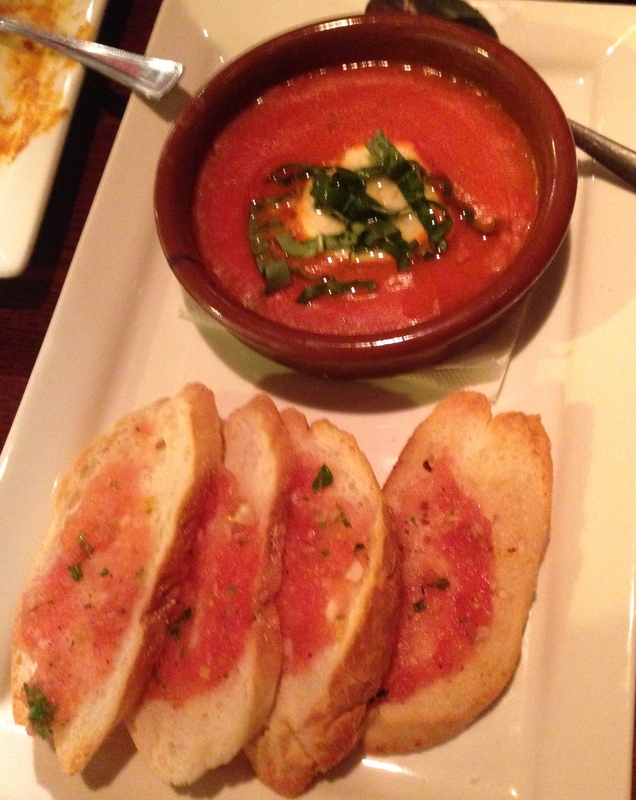 Another tomato based tapa that I always enjoy, and it was no different here, was the queso de cabra ($7) or goat cheese. It consists of is a chunk of goat cheese that is baked in a tomato basil sauce topped with truffle oil with a side of tomato and garlic rubbed pieces of toasted bread. What more could you ask for? Well, for one thing, I would suggest that they make it more even ratio of cheese to tomato sauce since I felt like we got cheated out of the earthy cheese that goes so perfectly with the seasoned and warm tomato sauce on the crusty bread. 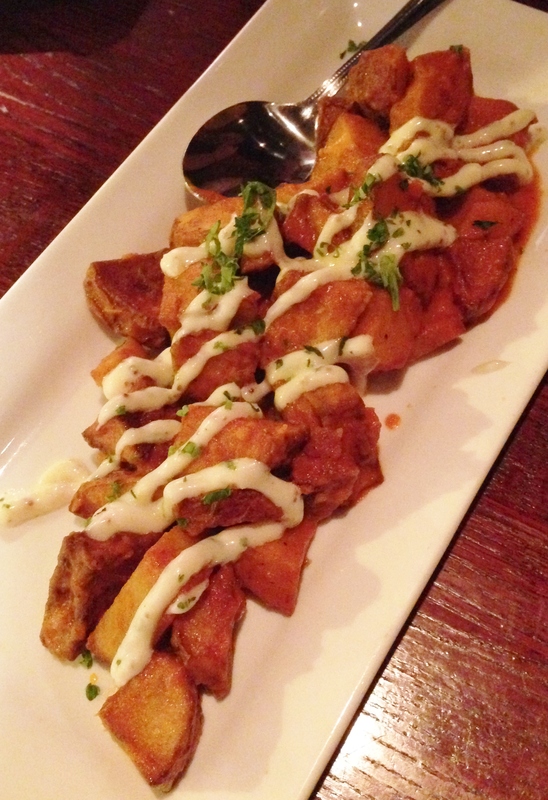 On the plus side, we followed it up with two of my favorite tapas: patatas bravas ($7) and dátiles con tocino ($7). With the former, it is hands down my favorite tapa. It’s nothing fancy since it just consists of cubed and fried potatoes and a paprika infused aioli. So easy, yet never reproduced Stateside surprisingly. This version of my favorite tapa was almost like what I inhaled back in Barcelona yet not. The white sauce was more on the mild side, and the potatoes were also covered in a chunkier tomato sauce bordering on an Italian marinara. As for the dátiles con tocino, they were the same like I´ve had before yet different. These sweet and gooey chunks of heaven were put to bed with a crunchy snuggie of bacon, but I think the sweet sherry reduction was a bit too much a case of gilding the lily. We weren´t only sampling creatures of the land but also the sea. 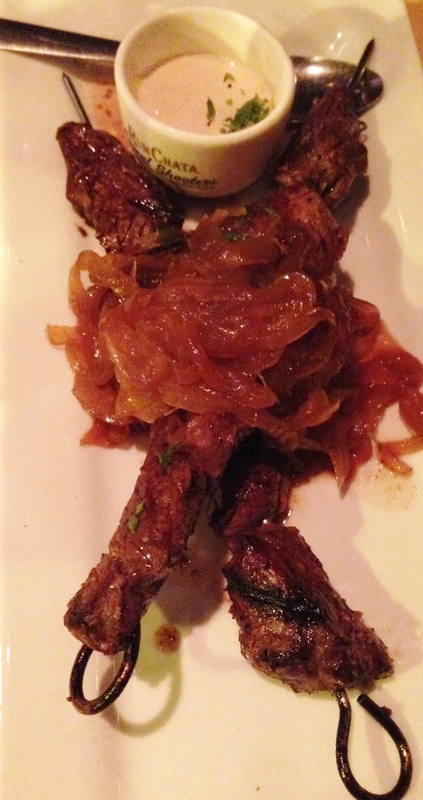 The script flipped when they brought out our pulpo a la plancha or grilled octopus ($9). This was another salute to Galicia which is known for quality grilled octopus seasoned with paprika. 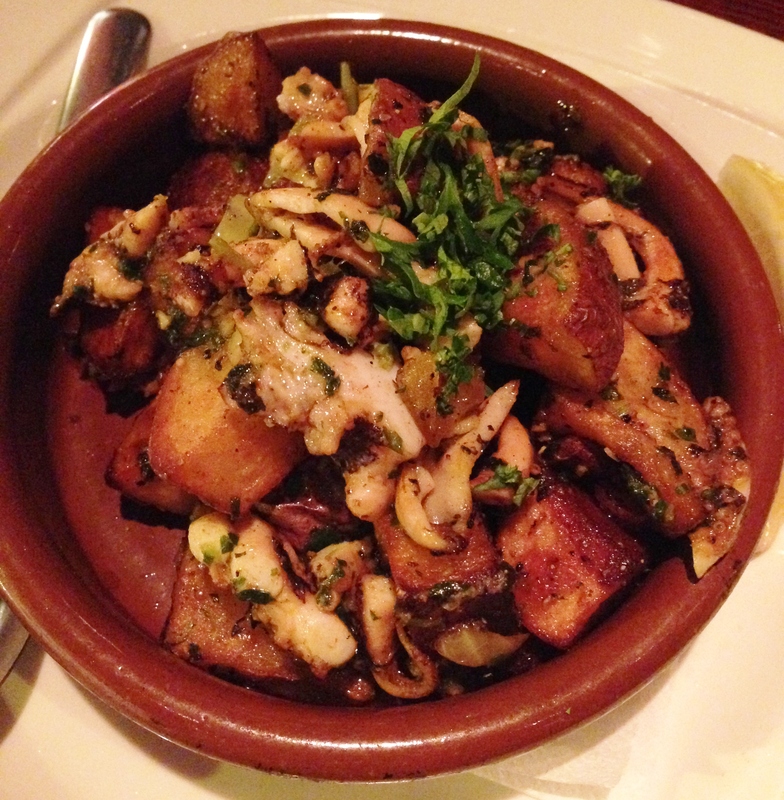 I didn’t taste much of the almond pesto, but the squirt of lemon over it with the herb coated potatoes made it a good mix of surf and tuber turf. The final two tapas we had wouldn’t really be considered true tapas. The pincho punta de res ($7) is a supposed to be an homage to Basque culinary traditions where the word actually comes from the Spanish “pinchar” meaning “to pierce”. If you go to the Basque Country in northern Spain, you will notice that all of their “tapas” are actually pierced with toothpicks and not just served in a dish. 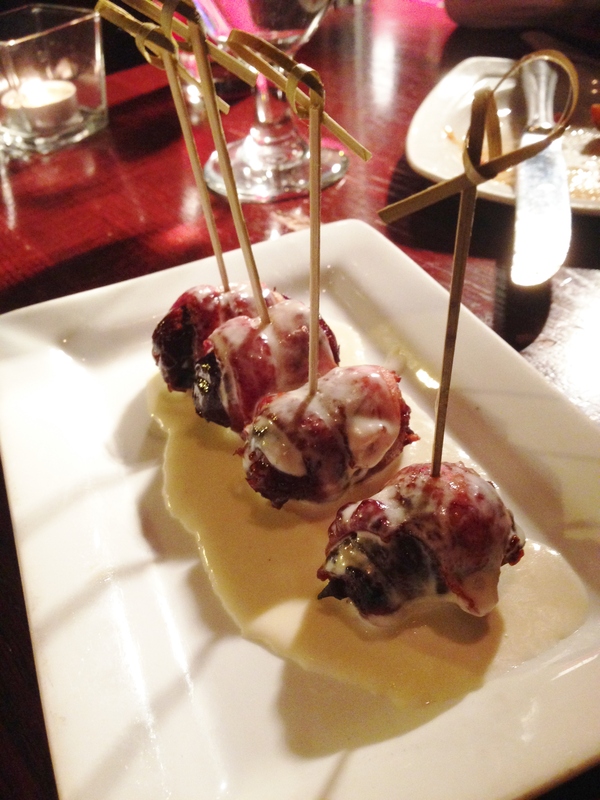 Therefore, I don’t understand how these pinchos are Moorish as indicated on La Taberna’s menu. Origin’s aside, I thought these skewers were more like taking a page from the Brazilian steakhouse than a tapería, but this didn’t take away from the high quality of the peppered steak that was paired with a generous helping of tenderly caramelized onions and a cup of sinus clearing horseradish sauce. Surprisingly, we still had a bit of room left at the end of the meal for another classic Spanish dish in the form of paella con pollo y conejo or paella with chicken and rabbit ($12). 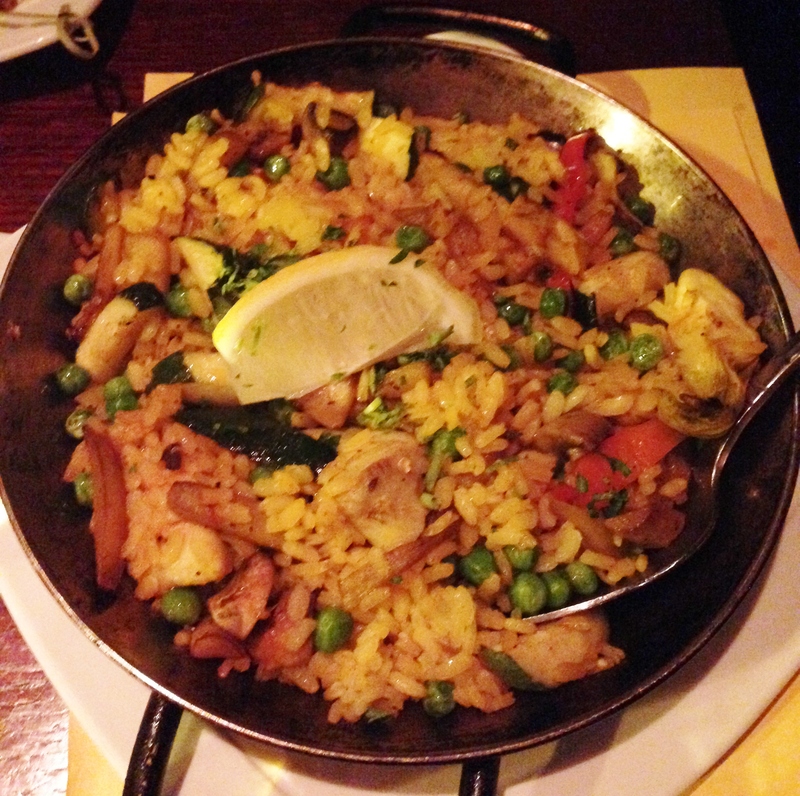 The word “paella” comes from the Latin “patella” or Old French “paelle“, both of which mean “pan”. The origin of the dish is a bit shrouded in mystery, but the most likely origin is from Valencia on the east coast of Spain during the reign of the Moors (8th Century-15th Century A.D.). The Valencian people managed to use the old Roman irrigation systems to grow more rice which was brought to the peninsula by the Islamic rulers. They then took the rice, local seafood, and cooked them together in a pan. 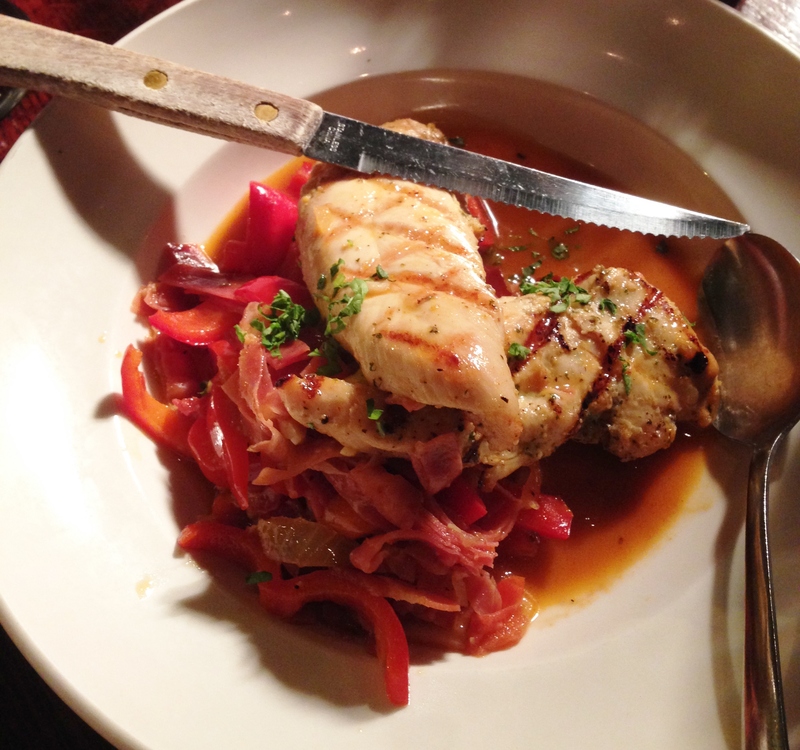 The popularity of the dish soon grew in the following centuries to other parts of Spain like Madrid where they added other types of meat, like the variety we ate at La Taberna, and eventually became world renowned. I visited Valencia during my residence in Spain, and I got a tin of paella from the mercado central, and it was a jump up from La Taberna’s version. La Taberna’s paella was good but not the best ever. It was well made with plenty of peppers, peas, onions, and even a Latin American twist with chile de árbol that gave the meal a smoky undertone. The smoke enhanced the chicken and rabbit, but these meat elements didn´t shine as much as the cooked veggies, in my opinion. I´d still recommend this paella though if you´ve never had it before and want one of Spain´s signature meals. So in closing, if you want to have a taste of Spain´s delights for a date night or just a fun night out of culture and culinary adventures, get down to La Taberna Tapas for a tapateo you won´t forget! 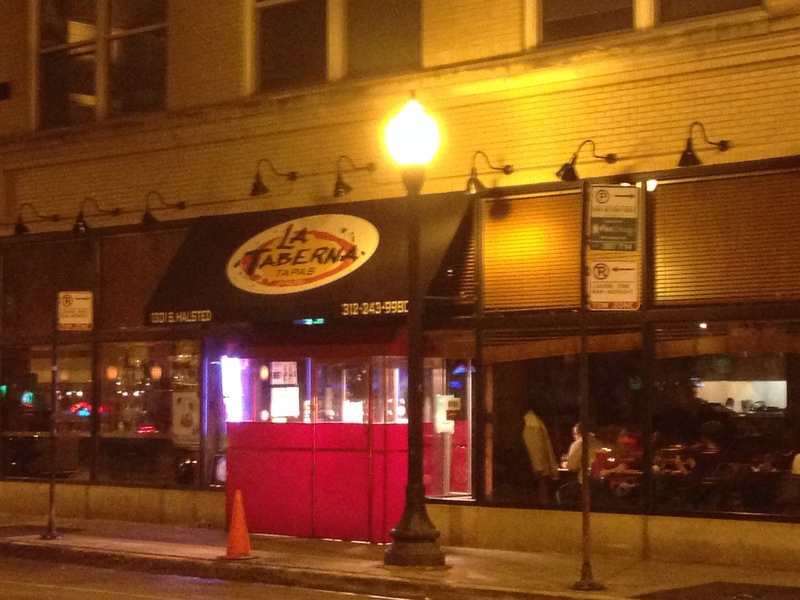 Posted in European Cuisine, Spanish and tagged beef, Beer, Chicago, chicken, eggplant, Galicia, Halsted, onions, paella, peas, peppers, potatoes, rabbit, rice, saffron, Spain, tapas, tomatoes, UIC. Bookmark the permalink.